We smiled and in the process got to see their big smiles...and they have the most beautiful smiles! 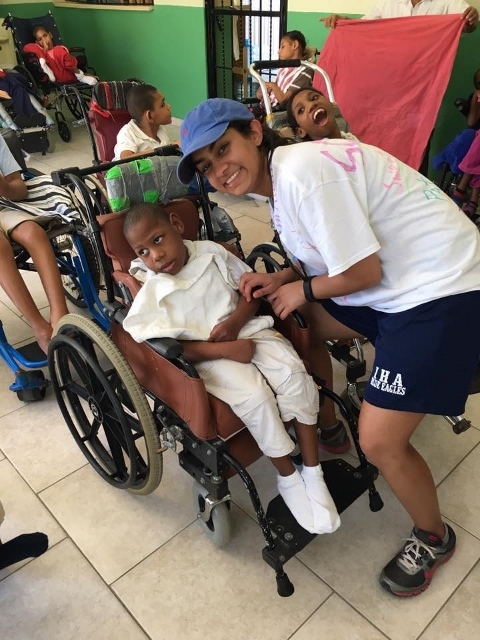 "I did a lot of service in high school so when I heard about the trip to Dominican Republic, I eagerly sent in my application and was so excited when I heard back that I was given the opportunity to go! As the days approached, I started to get a little nervous because I'm the type of person who "fears the unknown"... and there were A LOT of unknowns. I was going out of the country by myself with 15 people I didn't know and immersing myself with kids who had a culture unknown to me. Though I was nervous, as our whole group sat together in the airport at 7am on a Tuesday, I already felt an energy unlike any other. I knew that this was going to be an amazing week...and it was! To put into words the experiences we had is almost impossible. As soon as we got to the DR I watched as the people around me jumped right into action, to do as much as they could to serve. That's when my nerves completely died down and I knew that there was nothing to be nervous about; we were all here for a common purpose and that bonded us. Many of the kids we worked with are mute and in a wheelchair; however, we had the opportunity to see their little personality traits come out as they listened to the music Joe, our musician, played and as we sang to them. The work we have been doing really humbles us and we see the joy and thankfulness everyone here has to offer every time we complete a project. I'm so thankful for the experiences I've had and already can't wait to do more in the future."